Honeybees play a vital role in the pollination of all tree fruits. They are indispensable pollinators. Bee colonies were first brought to North America by early European settlers. Beekeepers keep honeybees for honey production and rent them to orchardists for crop pollination. There are about 100,000 managed bee colonies in Washington State. Beekeepers move colonies to various locations so that sufficient bees are available to pollinate crops adequately. The egg is cylindrical and is about 1/16 inch (1.5 mm) long. The larva is a white legless grub which lies curled up on the bottom of the wax cell of the honeycomb. When first hatched, it is about 1/16 inch (1.5 mm) long. It develops through four molts before maturing. The head, eyes, antennae, mouthparts, thorax, legs and abdomen are visible and resemble those of the adult. Only the wings are not yet developed. The adult is covered with dull yellow and black hairs arranged in alternating stripes across the abdomen. The hairs trap pollen as the insect moves from flower to flower so the workers are often covered with a dusting of orange or yellow pollen granules. The worker bee (female) averages 1/2 inch (13 mm) in length, the drone (male) about 2/3 inch (16 mm), and the queen about 3/4 inch (18 mm). The queen, whose main function is to lay eggs, has a long tapered abdomen. Honeybees are social insets. A colony of bees is a family unit containing a queen, drones and female workers. During spring and summer, there will be several thousand drones in a healthy colony. Their main role is to mate with new queens. Most bees in a colony are sterile female workers. The population of a colony varies from 10,000 to 15,000 in winter to as many as 60,000 in midsummer. A colony of honeybees needs food. Workers forage for pollen and nectar and bring it back to the hive where it is stored in combs. Workers also keep the hive clean and take care of the brood. Brood is a collective term for eggs, larvae and pupae. The queen lays eggs in cells in the combs in the colony, and the workers feed royal jelly and nectar to the larvae. Most larvae are only fed royal jelly for a few days, but a future queen will be fed royal jelly during the entire larval period. When the larvae are mature, workers cap the cells and the larvae change to pupae. About 12 days later, adult bees emerge. The life cycle from egg to adult takes 21 days. Pollination is the transfer of pollen from the anther (the male part of the flower) to the stigma (the female part). Without pollination there is little or no fruit. While foraging for nectar and pollen, bees touch the anthers and stigma of flowers, transferring the pollen. Most fungicides, herbicides, plant growth regulators and nutrients can be applied to bloom because they are not harmful to bees. However, bees are vulnerable to insecticides used in orchards. A bee that picks up insecticide residues on open bloom is almost certain to be killed. 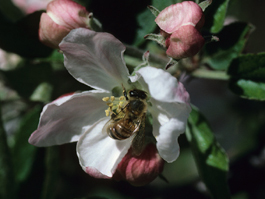 Bee kills can be avoided by never applying insecticides when any blossoms are open or when the spray may drift to open bloom in adjoining orchards or interplants. However, there may be times when orchard pests need to be controlled when there is bloom in the orchard or when there are blooming weeds. 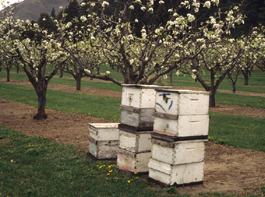 There are real differences in the bee hazard and toxicity of the different insecticides used in orchards. Some are always hazardous on blooming crops, while others (mainly miticides and fungicides) are not hazardous to bees at any time. 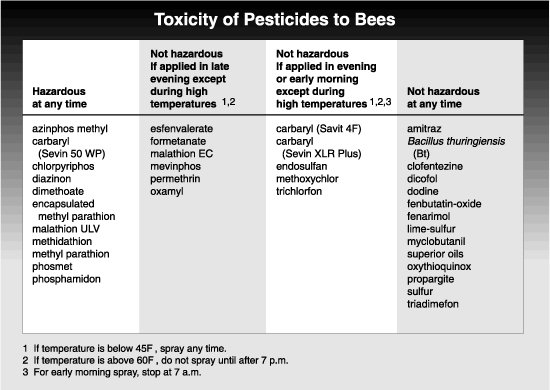 See the following table for indications of the hazard of pesticides to bees. The toxicity of those rated as hazardous at certain times depends primarily on how quickly the residues break down. The residues of some break down in within a couple of hours, which means that they can be applied in the evening or early morning. Those with residues that take several hours to break down should only be applied in the evening. During the growing season, mow or beat down blooming orchard cover crops before applying insecticides that are hazardous to bees. 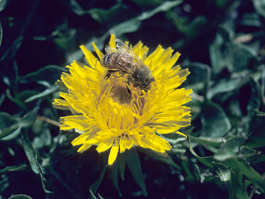 This is especially important before tree bloom, as this is during a critical foraging period when bees will fly several miles to obtain pollen and nectar from even a few blooms of plants such as dandelion or mustard.